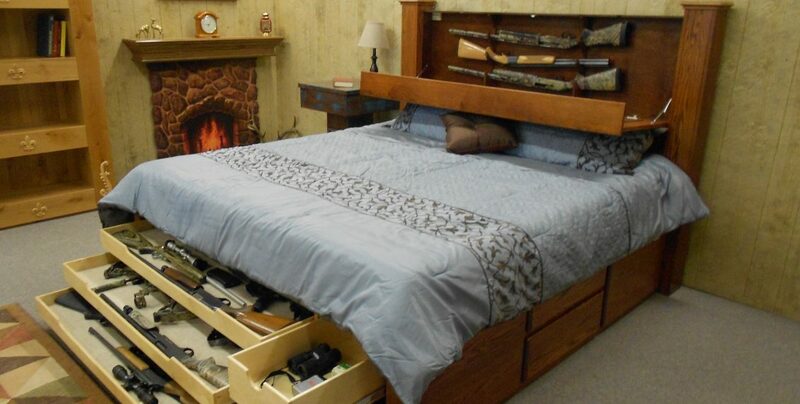 A headboard gun safe is essentially a hidden compartment in the headboard of your bed for storing guns. Millions of home break-ins occur every year in the United States alone. Owning a gun could be the right step and an exercise of your fundamental rights under the United States constitution. However, purchasing a gun alone may not be enough. You have to find innovative ways to hide them in order to get the upper hand over your enemy when under attack. There are several factors to consider when choosing a hidden bed compartment for your gun safe. These furniture safes can be a great way to keep your firearms intact from unauthorized access. However, you have to get it right during the buying process in order to get maximum benefits. The quality of wood used in the manufacture of the hidden bed compartment is one of the most important factors to consider. Getting inferior wood is counterproductive as the bed will not last long enough to give long-term benefits. Mahogany, Pine, and Oak are some of the best types of wood to target if you want a long-lasting headboard to store your guns. Sure, the headboard safe may be hidden but you wouldn’t want your guns to be stolen in the unlikely event that they are discovered. It is therefore important that there’s some sort of locking mechanism. If you have teens at home, you wouldn’t also want them to discover the hidden compartment. Therefore a good lock will give another layer of security to your guns. 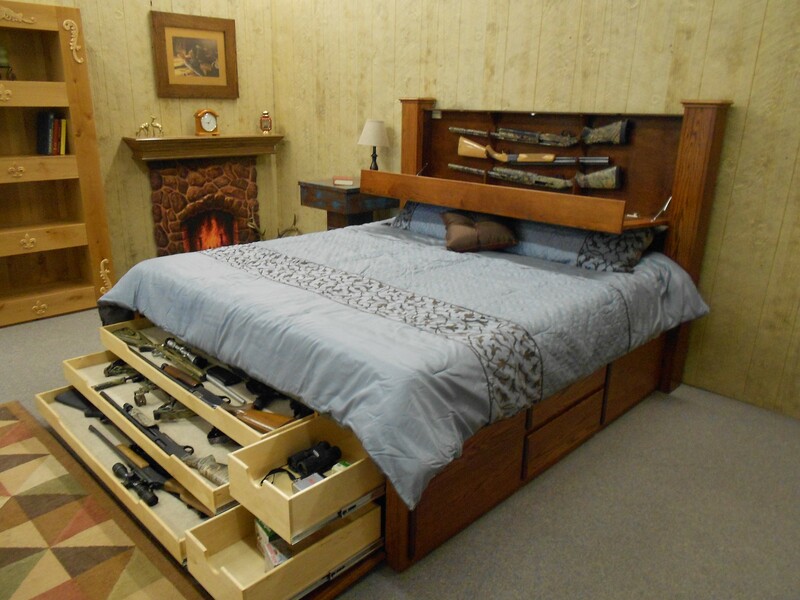 What kind of guns do you intend to store in your bed’s headboard? If you own a shotgun or rifle then there’s no point buying a model designed for hiding pistols. Getting the right size gives you ample space to hide whichever gun you own. Make sure you get the dimensions of the compartment beforehand to ensure your guns will fit comfortably before pulling the trigger. There are so many benefits that come with a security safe hidden inside the headboard of a bed. Here are a few of them. Hiding guns in plain sight around your home is smart. While a lot of home robberies occur during the day when you are likely to be out, a good percentage occurs in the middle of the night too. Even if your home is broken into in the middle of the day, there’s a higher probability that thieves will fail to discover your guns. Most headboards used as gun safes are designed to look like any regular one meaning thieves won’t even think about looking for a secret compartment. You could come back to a ransacked home with your guns, ammo, and other valuables still intact. Remember, thieves can’t steal what they can’t find! Since most of us spend 6-8 hours in bed, which better place to hide your guns than a hidden compartment inside the bed’s headboard? In the event of a midnight attack, tiptoeing into another room to find your guns may be too risky. In fact, most owners are forced to stay hidden in the bedroom because they don’t want to risk their lives. Thankfully, a gun safe hidden in your bed’s headboard saves you the trouble of debating whether to go pick up your guns or not. You get easy access to them without much effort. A headboard with a firearm safe also gives you an upper hand over your enemy. When under attack at home, every advantage you get can be lifesaving. The truth is most burglars aren’t even aware of the idea of a gun safe headboard. This therefore allows you to surprise them and save your life as well as that of family members. If you have some woodworking or carpentry experience then you are in luck. Instead of spending a huge amount of money, you can actually build one of these on your own. Fortunately, there are lots of free plans available online and elsewhere for headboards with secret gun safes. Building it yourself saves you lots of money and allows you to build it to suit your tastes and specifications. It is quite clear that headboard gun safes have so much to offer in terms of security and storage capacity regardless of the number of guns you own. Lots of gun owners are looking for ways to hide firearms in everyday furniture and the headboard has become one of the most popular options. However, make sure the hidden compartment inside your bed headboard is large enough to accomodate your loaded pistols and/or rifles.